You can celebrate America's birthday in the surf or the snow this year. Two California ski resorts are still open. 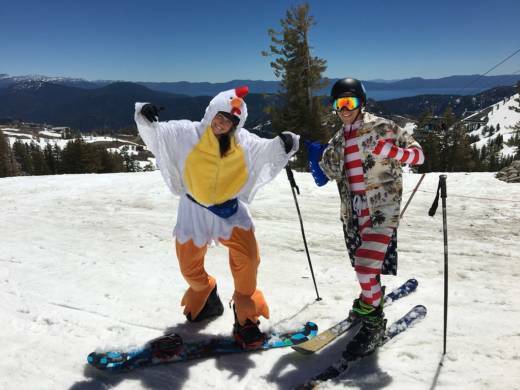 It is the fourth time Squaw Valley Alpine Meadows has had enough snow for Fourth of July turns since the resort opened in 1949. Mammoth Mountain predicts there may be enough snow to stay open through August. On a recent 80-degree Sunday, a stream of skiers and snowboarders in board shorts and tank tops tumbled out of the gondola at Squaw Valley. Nearby, a waterfall poured through a gap in the cliffs as the hot skies penetrated the snow. Clearly the bluebird skies are the highlight rather than the conditions. Skiers say the wet snow feels like gooey oatmeal, mashed potatoes or ice cream. 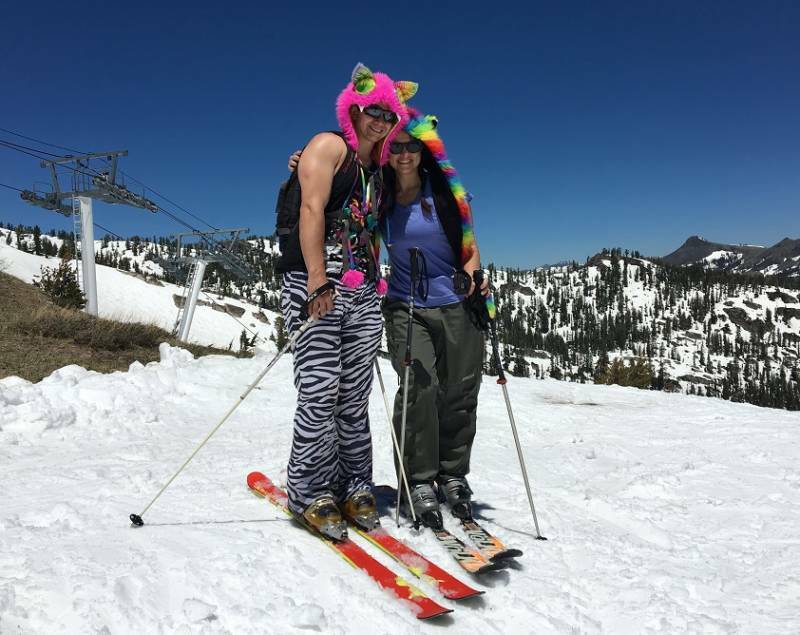 Peopled posed for photos on the slopes with Lake Tahoe’s turquoise waters glimmering in the distance. Women were dressed in slinky bikinis, black lingerie and red booty shorts, yet it was Visconti’s outfit that stole the show. All the liquid running off the mountain has lifted water levels in Lake Tahoe to capacity. Water managers are releasing as much runoff as possible through the Lake Tahoe Dam at the mouth of the Truckee River. Usually the upper river is knee-deep flat water that families raft in inner tubes, but it's currently a frothy beast closed for swimming. Tributary Waters, the company Saffo works for, offers trips down a safer section of the Truckee River closer to Reno. This year Saffo warns his clients to hold on tight because if they fall in they could spend a long time in the icy waters. In fact it could be lethal. The Associated Press is reporting that western rivers have claimed at least 14 lives so far this year. Fresh water from the Sierra is rushing all the way across the Central Valley and pouring into the San Francisco Bay. The runoff is so powerful, it’s pushing back the salty ocean water all the way to the Golden Gate Bridge, which is much different than what happened during California's recent drought when runoff barely trickled into the Bay. Even though the snowpack on April first was 164 percent of normal and the winter was one of the state’s wettest on record, it wasn’t as cold as previous generations. Jeffrey Mount, a water expert for the Public Policy Institute of California, says that’s a sign of climate change. Warmer temperatures mean melting snow evaporates quicker, trees bloom earlier and soils dry up faster. Though Mount says that doesn’t add up to another drought -- at least not in the near term. He cautiously predicts California is likely to have another snowy winter because wet years tend to cluster together. Though he says he wouldn't put money on it.